The tenor, who is under contract to Sony Classical, is about to make a debut release on Erato (Warner). 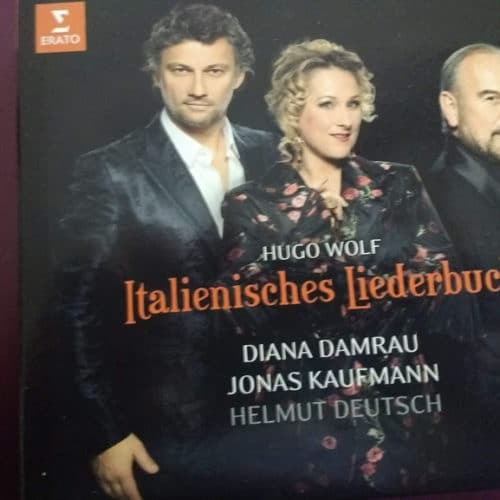 It’s a live recording of his recital of Hugo Wolf songs with Diana Damrau and Helmut Deutsch. Not commercial enough for Sony. Maybe this has nothing to do with Sony but is just due to the fact that Diana Damrau is under contract at Erato. It’s not precisely his ‘debut’ on Warner Classics. His earliest recording was for them, as he is actually the off-stage Alfredo who sings 8 bars or so just before the end of Cristina Gallardo-Domas’s ‘Sempre Libera’ on her 2002 CD ‘Bel Sogno’, released by Warner imprint, Teldec. His earliest recordings are of Carl Loewe’s Die drei Wünsche (1996), Così fan tutte and Abert’s Ekkehard (1998), Marschner’s Der Vampyr and Bruckner’s F-Minor Mass (1999), and Mendelssohn’s Elias (2000). He has seven complete opera recordings with Warner, made between 2005 and 2015. Most recent: Aida. This recording is absolutely wonderful. I’ve been to several concerts of this “italienisches liederbuch”-tournee. Outstanding!!! The promotional videos associated with this release are an embarrassment. The dignified days of Fischer-Dieskau and Schwarzkopf are surely over and in more ways than one. Not a good thing. I tend to agree with you. I had the good fortune to hear Fischer-Dieskau when I still lived in Germany. And also I think Jonas Kaufmann is a wonderful singer, there is nobody better than Fischer-Dieskau as a Lieder singer. Although Herrmann Prey wasn’t exactly a slouch either. Both are memorable. I’m just glad the disc is coming out! As I recall, the tour itself was felt unlikely to be a good seller, but the way the songs were arranged and the story which these three marvellous artists portrayed meant it turned out to be a huge success. Hope the CD release is too. Except that no one has ever bought or listened to a recording of Lied for the pianist, as essential as a pianist’s collaboration is. Back in the day labels would lend “exclusive” artists who wanted to work with another label’s “exclusive” artist provided the favor was returned. That is how we got the Perlman/Ashkenazy sonata recordings: Franck and Brahms Horn Trio on Decca (“London” to those of us in the US of A) and the Prokofiev sonatas on RCA Victor Red Seal. Both labels benefited as did we listeners. I think Leontyne Price and some other vocal artists who had exclusive contracts were also part of these sorts of trade offs. So perhaps Sony will be made whole with its own Damrau/Kaufman release.